Outraged by that headline? You haven’t seen those news reports because Christians aren’t taught to commit atrocities like that. Have you ever wondered why you don’t see headlines about the atrocities actually committed against Christians every day? Such horrors are barely thinkable, of course. But they have all occurred in reverse, with Christians falling victim to Islamist aggression. 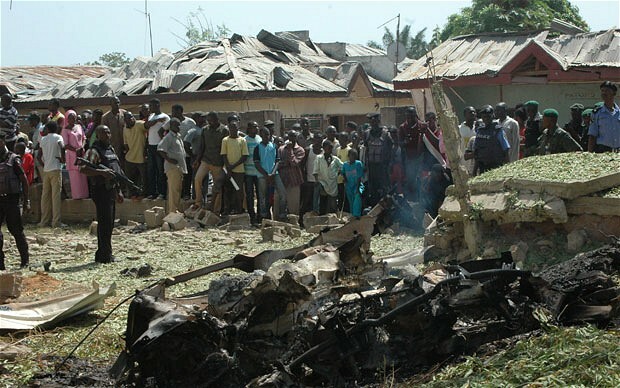 Only two days ago, a suicide bomber crashed a jeep laden with explosives into a packed Catholic church in Kaduna, northern Nigeria, killing at least eight people and injuring more than 100. … Why is such a huge scourge chronically under-reported in the West? … Take the fallout of last month’s protests around the world against the American film about the Prophet Mohammed. While most of the debate centred on the rule of law and the limits of free speech, almost nothing was said about how much more routinely Islamists insult Christians, almost always getting away with their provocations scot-free. Hateful messages breed hateful acts. Is it any surprise that mobs have set fire to one church after another across Egypt in recent years?